David Price was dominant at times, using a high-90s fastball to overpower several of the Yankee hitters. The 7 2/3 inning stint was Price’s longest of his career, but one wonders if the 111 pitches needed were an unnecessary taxation on the young lefty’s arm, especially so early in the season. 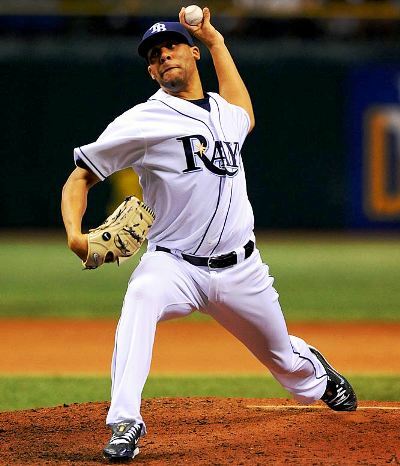 The Yankees had their hands full with Rays lefty David Price. In the top of the 4th inning, the Yankees got on the board first when Alex Rodriquez tripled in Nick Johnson and then scored on a throwing error by Dioner Navarro. The ball just missed going out of the ballpark, denying Arod sole possession of 8th place on the all-time HR list. Javier Vazquez pitched well for three innings, but then faltered in the 4th inning. It looked as if Vazquez tired a bit in the inning, losing both command and velocity on his fastball as a result. Nearly every base hit was surrendered on the fastball, making it a little odd that Posada kept going back to the pitch, especially when the off speed was working so well. Posada seemed to over-rely on the fastball in both Sabathia’s and Burnett’s earlier starts, so that’s something worth watching. Because Vazquez has four quality pitches, it will be important for both he and Posada to get on the same page. Otherwise, we could have another pitcher-catcher controversy on our hands. Vazquez wound up yielding 8 runs, which was the most he had given up since June 25, 2006, when he was tagged for 9 runs against the Astros. Vazquez also wasn’t helped out by his defense in the 4th inning. Marcus Thames failed to make two plays that Brett Gardner probably would have. The game tying single by Navarro was a questionable play, but the ill-timed dive on Jason Bartlett’s base clearing double was an obvious mis-play. Thames is going to have to hit a ton against lefties to justify his spot in the lineup because he has already exhibited very poor defense in left. Nick Johnson finally filled the hit column with a single and double off Price. Mark Teixeira, however, remained hitless and has now started the season 0-16. The Yankees record (since 1920) for the longest hitless streak to start a season is 27 PAs and 24 ABs, both by Wally Schang in 1921.